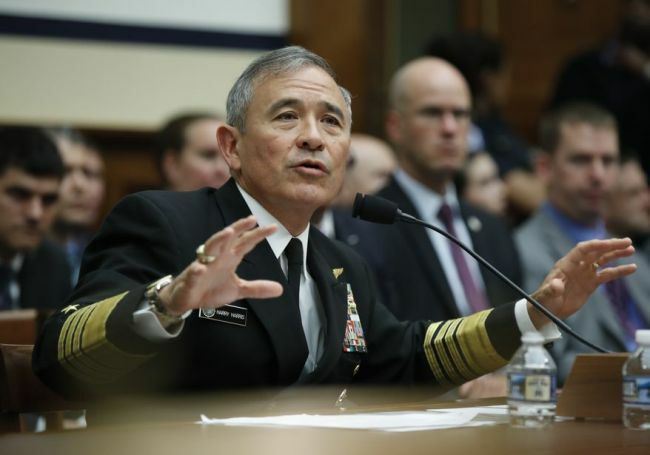 US President Donald Trump on Friday named Harry Harris, current commander of the US Pacific Command, his first ambassador to South Korea at a critical diplomatic juncture on the Korean Peninsula. Harris was reported to be Trump’s pick last month after initially being tapped as the US ambassador to Australia. If confirmed by the Senate, Harris will serve as Washington‘s top envoy to Seoul at a time when the allies have been seeking close coordination on a range of issues, including North Korea’s nuclear weapons program and bilateral trade. The Navy admiral was born in Japan to a Japanese mother and American father. He has led the US Pacific Command in Hawaii since May 2015, overseeing the 28,500-strong US Forces Korea and waters near the Korean Peninsula. On foreign policy issues, he is considered a hawk, along with the latest additions to Trump‘s national security team -- Secretary of State Mike Pompeo and National Security Adviser John Bolton. Pompeo reportedly wanted Harris in Seoul, not Canberra. Harris also called for increasing economic and diplomatic sanctions on Pyongyang until it abandons its nuclear and ballistic missile programs. At a separate congressional hearing in March, he struck a cautious note on the prospect of a Trump-Kim meeting. Trump and Kim are set to meet in Singapore on June 12 to discuss the denuclearization of the regime, although Pyongyang threw the high-stakes summit into doubt this week. It protested that the US was demanding the “unilateral” dismantlement of its nuclear weapons program and also blamed ongoing air combat drills between South Korea and the US for undermining the growing peace mood on the peninsula. Responding to the threat to call off the summit, Trump said Thursday that he does not have the so-called Libya model in mind for North Korea‘s denuclearization and offered to provide strong security guarantees to the regime. Moon is due in Washington next Tuesday to meet with Trump and coordinate the allies’ positions ahead of what would be the first-ever US-North Korea summit, a meeting he has helped engineer. The South Korean president met with Kim at the Demilitarized Zone dividing the Koreas last month. They agreed to pursue “complete denuclearization” and a formal end to the 1950-53 Korean War.